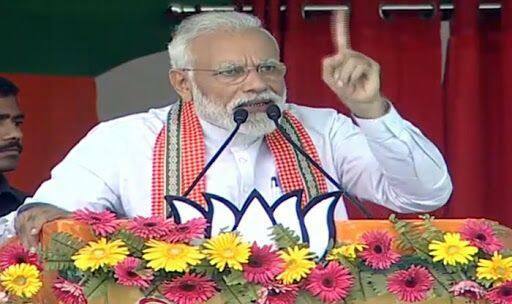 Addressing a public rally in Bhagalpur, the Prime Minister blamed the 'Mahamilavati' gang for intending to strip the Indian armed forces of their powers. Narendra Modi at a rally in Bihar. Photo Credit: ANI. Patna: Prime Minister Narendra Modi on Thursday stated that ‘Mahamilavati’ gang were afraid that if he returns to power, their shops of corruption and dynasty politics will be shut down. Addressing a rally in Bihar, PM Modi said, “When Modi comes back again then their corruption will be completely finished, their dynastic politics will be finished, their loot in name of poor will stop, their politics of case and religion will stop, tukde tuke gang bhi tukde tukde ho kar bikhar jaeyga”. Meanwhile, as the Lok Sabha elections began on Thursday, Prime Minister Narendra Modi urged voters to turn out in large numbers to exercise their franchise. “I call upon all those whose constituencies are voting in the first phase today to turn out in record numbers and exercise their franchise,” he tweeted. During elections, Modi often takes to Twitter to urge people to vote.? “I specially urge young and first-time voters to vote in large numbers,” he said.